Located in the desert wasteland, weather conditions in Sawa reach extremes. There is little shelter and the daily routine includes waking up at 5:00 am with no breakfast, running for hours on end, learning and practicing to shoot with different firearms, and never seeing your family. One can understand the fear of letting one’s child go there. The most probable life options (had Hermon and her mother stayed in Eritrea) would have been to be conscripted into the national service, either as a minor or when she turned 18. Alternatively, she could have been hastily married off by her family to spare her the likelihood of being conscripted. Once a woman is married, and falls pregnant there is a de facto exemption from military service. The Eritrean government is then often more lenient towards conscripting such women or girls. The implications of taking this option has worrying consequences as girls frequently become victims of child marriage and undergo dangerous pregnancies before their bodies are physically mature. The United Nations Children’s Fund (UNICEF), in its report titled ‘State of the World’s Children 2012’, ranked Eritrea as having the 12 highest rate of child marriage in the world. 20 per cent of the children are married by the age of 15 and 47 per cent by the time they are 18. 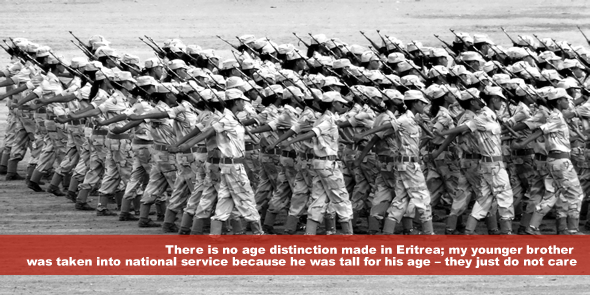 There is no age distinction made in Eritrea; my younger brother was taken into national service because he was tall for his age – they just do not care. Eritrean children are indeed experiencing a transition, the hijacking of their youth. Families are being destabilised and children with nothing to lose are preparing for lives as runaways. As part of the last group of students to attend the University of Asmara before it was closed in 2006, Girma started to learn of concepts such as democracy and freedom, concepts he soon realised was not reflective in his country. He could not envision completing his degree and securing a decent job in his country to help provide for his widowed mother and seven siblings, nor begin to daydream about falling in love and starting a family of his own. No, on realising he had no money to pay for passage out of the country, Girma was thinking about how, in his final year, when he was to be sent to military training as a condition for graduating, he would feign enthusiasm for military service and manipulate the military into assigning him to the lowlands. The lowlands are the closest posting to the Sudanese border, and when the right opportunity comes, he would make a run for it. He knew the risks and for weeks before leaving, nightmares tormented his sleep as he feared being captured, detained, or even worse—death by shooting. The day came when he fled with one of his friends into the forest. They lost their direction and came across a military camp they thought to be Sudanese. Soldiers started to fire shots from only 10 meters away. In the midst of the panic, he was separated from his friend and had no choice but to assume he was dead. Girma ran for a whole day in the forest and by some twist of fate, he was reunited with his friend, a true blessing as his friend’s fluency in Arabic allowed them to arrive in Sudan and start negotiating for a boat trip to Europe. Inflicting physical harm on Eritreans has become a profitable practice but we all risk leaving because we do not see hope for our country. Looking back I should not have left the way I did, it was so dangerous. It is better to die at home than become a smuggled body. He knew he was desperate, he knew and understood the hopeless future awaiting him in Eritrea, but he says it was mere luck that he survived. There are well documented networks of human trafficking and smuggling in the Sinai, Egypt known for their severe physical harm and ill treatment of captives. Regardless of the dangers, Eritreans continue to flee at a rate that has it ranked as the 10 highest refugee producing country in the world; this for a country with a population of roughly 5 million people. My sibling died in Libya as many people do and two years ago I stopped telling people to run away, because I would rather die at home where I matter to someone, where my family can bury me. When I asked what they both grew up wishing to be, Hermon wanted to be a doctor and Girma developed a passion for business. The reality is, neither one of them would have been able to fully realise these childhood dreams in their own country; between national service obligations, a non-operational university, and the dire consequences for dissidents. Only luck and human resolve to flee could possibly have edged them closer to their dreams. One commonality binds both Girma and Hermon‘s lives- they both want to go home. However, there is a need for a different political dispensation. Girma and Hermon, as with many youths, want a country where they can realise a life of worth, where they can support their families, create ones of their own and not fear a system that has banned opposition, freedom of expression, religion and which ruthlessly crushes dissent. With the next three generations of African youth projected to account for 41 per cent of the world’s population, we need to ensure that a transition to a better future exists. Young people should have the space to enter the chapter of youth with guidance, security and abundance, so that they become adults who better support their people and nations where past generations have failed. Excellent piece, Thato Motaung. Thank you for raising awareness on the plight of the Eritrean people. it may sound fact for people not from Eritrea but the piece is hard facts. Excellent work, Good Job, well done.